Portobello mushroom beer. Portobello mushrooms are the most commonly consumed mushrooms across the world. They are also called button mushrooms when they are immature. The can grow to a large size and have a meaty texture when eaten. Portobello’s have a round creamy tan cap with almost black gills underneath. Traditionally from Italy, Portobello mushrooms grow well in garden waste, compost heaps, and by the road. Add 60 to 120 grams per liter of a brown ale to add a deep earthy rich flavor. Best to grow your own fresh mushrooms for you brewing ingredients. Portobello Mushroom Beer tastes the best when using freshly picked mushrooms that you dry yourself. 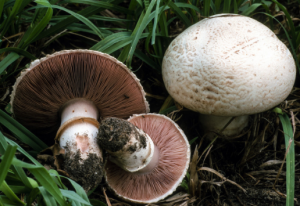 You can grow Portobello mushrooms inside or outside. When growing Portobellos outside ensure the temperature during the day is no more than 70 degrees Fahrenheit and not below 50 degrees Fahrenheit at night. You need a raised bed that is at least 20 cm deep. Fill with well-rotted compost and manure to at least 15 cm deep and cover with cardboard. Then cover with black plastic. This process is to sterilize the bed before adding the mushroom spores. Leave for two weeks before adding mushroom spores by lightly mixing them in. Let it sit until you see a white film spread across the surface. Add a thick layer of damp peat moss and cover with damp newspaper. Keep this moist by misting daily. Mushrooms should be ready to harvest in around 10 days. Growing Portabellos inside is similar to the outside growing process. Except you need a tray at least 20 cm deep. Fill the tray with about 15 cm of compost and mix the spores in. Store in a dark area until you see the white film spread across the surface. Add a layer of damp peat moss and cover with damp newspaper. Once the mushroom heads appear, remove the newspaper. Mist daily after removing the newspaper. Make sure it does not dry out. You can have mushrooms all year round for brewing your mushroom beer. Just dry out the extras so you never run out.